Ryals Avenue in Benton County on Monday afternoon. If you have a white or otherwise light-colored vehicle, you know the dilemma that signs like this cause. Put it into reverse and go the long way round? 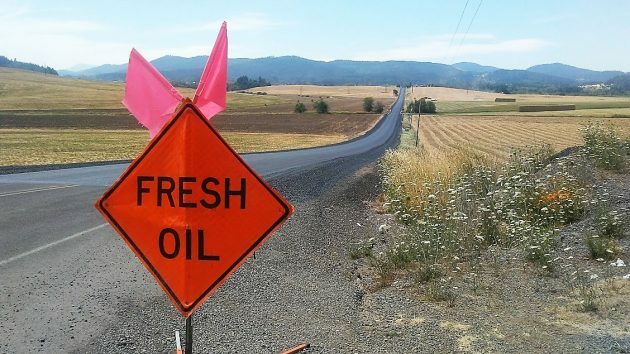 Or keep going and hope that the oil is no longer fresh, no matter what the road sign says? We’re all glad that ODOT and the county road departments are doing their best to maintain our highways. But as for loose gravel and fresh oil every few years, well, it’s the price we pay for roads that are in pretty good shape. The question comes up: What if you have no choice but to drive on through, and the oil splatters all over the side of your previously pristine car? There’s plenty of online advice on how to get rid of the mess. Somebody suggested wiping the stuff off with acetone. Others recommended WD-40, the miracle cure. The recommendation I like best: Take your rig to a car wash or detail shop where they know what they’re doing and let them deal with the problem. In the truck, in this case. Thanks for asking. One cure is to travel at a slower speed. The tires won’t be as likely to “pick” the material up so readily. So what to do with the “road hogs” that must travel faster???? As they zip by they’ll blast the side of your vehicle with the material anyway.